Yes, there was an earlier version of the Burgman 400 scooter, and even a 650 model as well for that matter. What the devil is a Burgman anyway? It’s a scooter manufactured by Suzuki – not an ordinary scooter, mind you, but rather what is today, commonly referred to as a maxi or super scooter. Burgman seemed to me a rather unlikely moniker for a Japanese-produced two-wheeler, so I felt compelled to ask where the name came from. I was told that it originated from the German term “Burg” for town or village which was governed by a leading man. Guess that makes sense, but I’m not sure my information source wasn’t just pulling my leg. Regardless of its name or how it originated, the Suzuki Burgman 400 is an extraordinary scooter, that when viewed from the front, looks for all the world like a sport bike – only when moving around to the side for a better look, does it take on the persona of a scooter, with no visible engine and a step-through mounting. There are several maxi or super scooters in the marketplace today, ranging from 400 cc to 650 cc in displacement, but the Burgman 400 seems to rank a cut above the others in terms of its styling execution. The light, rigid chassis and sleekly designed, curvaceous body not only gives the scooter a sporty appearance, but an aerodynamic advantage as well at higher freeway speeds. The widely-spaced “cat-eye” headlights and rakish windscreen with a lower vent add to the purposeful sport bike look up front, creating a smooth air flow over the rider, while the updated taillights wrap deeply into the body sides for a clean effect. Power comes from an all-new 400 cc, 4-stroke, DOHC, liquid-cooled, single cylinder, fuel injected motor that delivers power to the rear wheel through a Continuously Variable Transmission (automatic) via an enclosed final V-belt drive, that at first glance appears to be a shaft drive assembly. The 3.6-gallon fuel supply ensures a range that consistently measures in excess of 150, even when pushed hard. 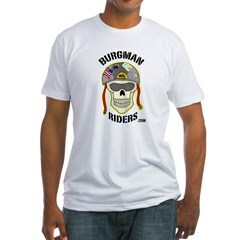 The Burgman 400 rides on tubeless Bridgestone tires – 14-inch up front and 13-inch out back. The Bridgestone rubber is mounted on 5-“Y” swirl spoke alloy wheels both fore and aft. The front suspension set-up consists of telescopic forks, with coil springs and oil damping with 4.3-inches of travel. Rear suspension is a link type configuration with a coil spring, oil damping and a 3.9-inch travel. Stopping chores are handled by double disc-front brakes and a single disc-rear brake.